Today I am recreating Canadian Living's April cover recipe in my kitchen. When I got my assignment I was excited but also nervous since I've never made or even eaten rhubarb before. I have seen lots of recipes that pair strawberries and rhubarb but I would always leave the rhubarb out scared it would make the whole dish sour. As I looked over the ingredient list I loved the combination of an Orange Vanilla Bean Custard combined with strawberries. 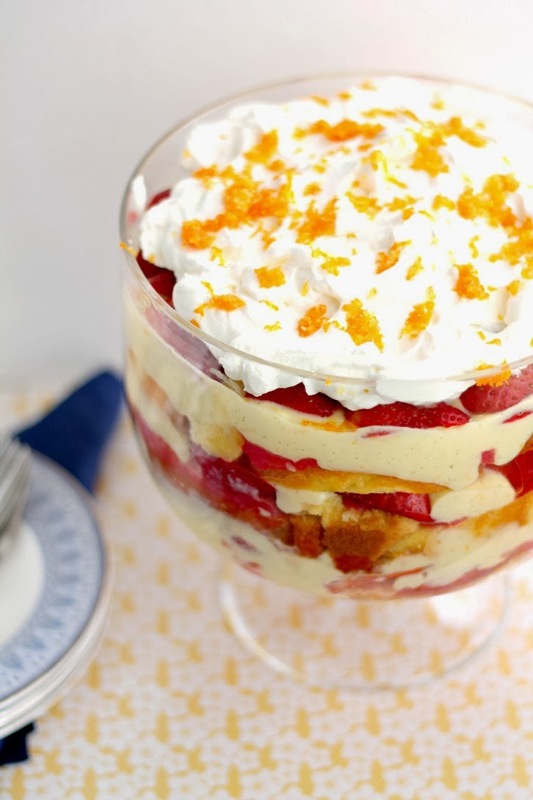 Growing up whenever we had trifle it was always the same...cake, jello, custard and sometimes some fruit mixed in. We all love our traditional trifle but were looking forward to trying something different. Canadian Living's Layered Strawberry Rhubarb Trifle starts with some Golden Loaf Cake which you can find in your grocery store's bakery section and layers it with a rhubarb sauce, strawberries and an orange vanilla custard. All topped with some whipped cream. For my trifle I used Organic strawberries and with the vanilla bean I found this to be an expensive dessert to make. This is a dessert I would save for the spring or summer when Organic strawberries are reasonably priced and taste much better. The recipe makes 12 servings so it would make a great dessert for a dinner party especially since you can make it the day before. While making the last layer in the trifle I forgot to put the strawberries between the rhubarb sauce and custard so I just arranged them on top. This trifle was very easy to make and buying the cake rather than making from scratch saves a lot of time. The trifle should sit in the fridge for 12 hours prior to eating. We couldn't wait that long and had a taste after about 5 hours. We loved it! But I strongly suggest to wait the 12 hours because it tasted so much better the next day. The rhubarb sauce was an excellent addition to this trifle. I cooked mine a little too long so there were no pieces of rhubarb left. The rhubarb sauce went very well with the strawberries and orange. There was not a strong sour taste at all. I will definitely be using the rhubarb the next time I come across it in a recipe. This was a dessert we all loved. It is not overly sweet and has a wonderful orange flavour to it. I would definitely make this dessert again for a dinner party. The flavours are all screaming spring! You can find the recipe for this wonderful trifle over at Canadian Living! You can also see how the other Canadian Living bloggers' trifles turned out at this link. Sounds delicious. I love trifles, especially for large parties. Asi, this is GORGEOUS! I've never eaten rhubarb, but I saw some at the grocery store this week! I went to grab some but then got scared and put it back lol. LOL...That is so me....I was so scared to use the rhubarb. Any recipe I've ever tried that had rhubarb I would just leave it out. But in this recipe it's cooked with sugar and orange juice and I guess that reduces the tartness. :) I was also nervous taking this picture b/c it's so big and I usually take pictures of things that are small. I've never cooked or eaten rhubarb either... I've been scared! Something that looks like red celery doesn't seem like it could be dessert! ;) But I'm glad yours turned out well... the trifle is beautiful!